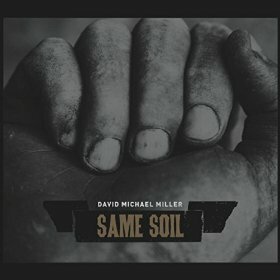 I just received the newest release, Same Soil, from David Michael Miller and it, like his 2014 release, Poisons Sipped , it's quite remarkable! Opening with All The Blues To You, a smokey, slinky, groove machine this release is off to a real nice start. Miller has a deep but silky voice and a great funky feel. Joined by Mike Brown on drums and mandolin, Jim Ehinger on piano and Tom Vayo on bass this is a real nice opener. Just Ride, jazzy twist on a blues theme opens quietly but opens up with a lot of heat. His own sumptuous guitar soloing, scorching slide work and nice B3 work from Ehinger give this track a spicy flavor. Gospel influenced Got Them Blues, has super piano and B3 work from Ehinger and wicked slide riffs from Miller complimenting the lead vocal. His own hand claps and drums by Carlton Campbell pushes the track along nicely. Easing back into an excellent electric soulful blues ballad, Friend Of Mine, Miller shows what a super voice he has. This track is certainly one of my favorites on the release with beautiful sax work from Jason Moynihan and some of Miller's warmest guitar work on the release. A definite nod to Mr Morganfield, Doing Me In, Doing Me Wrong has the basic components of an original but with modern adornment. Miller does a really smart job of blending the guttural feel of I'm A Man with his own modern styling. Jeremy Keyes lays down some real nice harp work on this track and Miller shows control on guitar, even when the track breaks into a scattered step jazz feel, allowing the track to maintain it's primitive roots yet with today's tastes. Clever pop jazz style track, Shoes To Shine, has a really nice rhythm courtesy of Nick Patterson on bass, Ehinger on Rhodes and Josh Miller really snapping the drums. Sax work from Barry Arbogast and frenzied slide work from Miller really builds the climax on this radio perfect track. Soft and easy is the word on Needle To The Wheel. A nicely written and performed, primarily acoustic ballad makes it a super track for cross radio play. Funky, If'in You Hear Me, keeps a light pace with nicely woven B3 from Ehinger, slide work from Miller, bass by Richii Valentino, drums by Campbell and Moynihan on sax. Emotional singing by Miller complimented by his solid slide work is bound to make this a live favorite. Born To Lose comes out of the gate with Moynihan, Ehinger and Campbell ripping the irregular but really tight rhythm. Miller is riding high with really nice vocals. Moynihan and Miller each gut this tune with laser hot solos making this one of the hottest tracks on the release. Jimmy Reed like, Too Early In The Morning, has an easy shuffle feel. Robert "Freightrain" Parker drives on bass and Ehinger really rolls on piano. Miller 's vocals are bluesy, joined by Keyes on harp before kicking it into high gear for a hot finish. This is really Ehinger's track through and through... nice job! Wrapping the release is acoustic ballad, Man's Got Things To Do. Nicely written and performed, although quiet in stature, this is a really strong track. Featuring Miller on guitar, vocal, percussion, piano, Brown on B3, and John Kibler on upright bass this track leaves you wanting more. Haunting slide guitar work over primitive military style snare work gives this track an extra kick. Very nice!